You’ll learn more than fingerprinting and shoe castings from the former Master Police Officer. You’ll learn more than fingerprinting and shoe castings from Tidewater Community College Professor Rick James. His favorite textbook costs a mere $1.25. It’s a pocket-sized copy of the Constitution. “Required reading in my class,” said James, program head of criminal justice on the Portsmouth Campus. “Education is power, and the Constitution is a symbol of power. I tell my criminal justice students that 99 percent of the time if a case gets lost or the police are in trouble, it’s because of lack of knowledge of the Constitution. The longtime Norfolk police officer, also a former combat medic in the Army, takes a “Law and Order” approach to the classroom. Aspiring crime scene investigators learn about the basics of evidence collection and how to present those findings in court. Like many of his students, the 1981 graduate of Maury High School didn’t go to college right away. He joined the Army at 17, learning literally on the fly. It wasn’t unusual for him to be aboard a medivac, tasked with administering medication at different altitudes, “with people living and dying based on what I knew,” he said. After six years in the service, he spent the next 27 at the Norfolk Police Department, tackling assignments ranging from Vice and Narcotics to Gang Squad to the Detective Division. He was still an officer when he approached TCC about teaching as an adjunct. What started with one criminal investigation class developed into James being named program head in Portsmouth shortly after he retired from the department as a Master Police Officer. In addition to his on-the-job experience, he holds a bachelor’s in criminology from Saint Leo University and a master’s in government from Regent University. He also completed three years of legal education at Regent and graduated as a Virginia Law Reader. James has also undergone specialized forensic training at Wake Forest University. Take a class with James, and you’ll never be bored, his students say. You don’t get lost in James’ class, either. He uses assigned seating and teamwork to keep students engaged throughout lecture and instills confidence by assigning leadership roles. Often he has to remind students they are indeed smart enough to do what he is asking. “I told one of my students she was going to be the leader of a group and she told me I made a big mistake,” he said. “I didn’t make a mistake,” he assured her. “I’m not college material,” she responded. 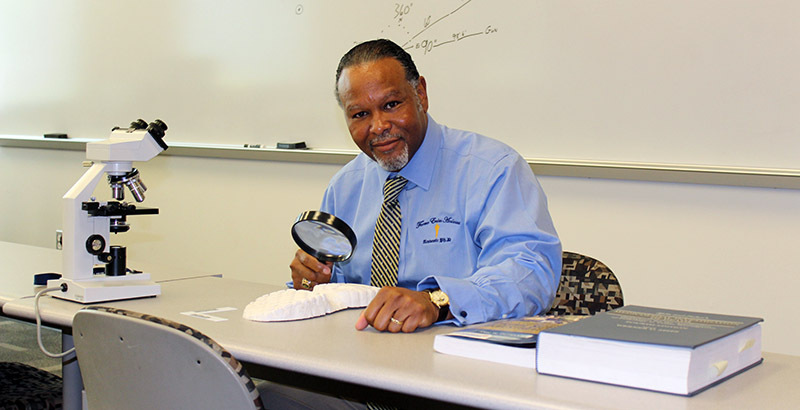 James started the Criminal Justice Club on the Portsmouth Campus, which allows students to learn from experts in the field and even complete mock crime scene exercises. Last spring the club spent the day at Liberty University’s forensic “body farm,” participating in a staged investigation. In his free time, James and wife Theresa enjoy cruising on their motorcycle, and he’s an avid chess player. He has four adult children, including his son, Richard J. James, who teaches computer-aided drafting and design classes at TCC.